For over four decades, states have enacted policies attempting to address alcohol use during pregnancy. In collaboration with the Alcohol Research Group (ARG) and the Pacific Institute of Research and Evaluation (PIRE), we conducted the first study to date examining whether these policies have their indented effects. Using data from over 148 million births over 50 years, we found that most state-level policies do not improve birth outcomes, and that several policies are associated with poorer birth outcomes, such as low birthweight, premature birth, and a low APGAR score. Even policies that are meant to be supportive of pregnant women, such as policies that require mandatory warning signs related to alcohol use during pregnancy, were associated with adverse birth outcomes and decreased prenatal care utilization. By contrast, we found that interventions targeting the entire population instead of focusing on pregnant women were associated with improved birth outcomes. To learn more about the results of this study, “Associations between state‐level policies regarding alcohol use among pregnant women, adverse birth outcomes, and prenatal care utilization: Results from 1972‐2013 Vital Statistics,” visit the journal Alcoholism Clinical & Experimental Research. 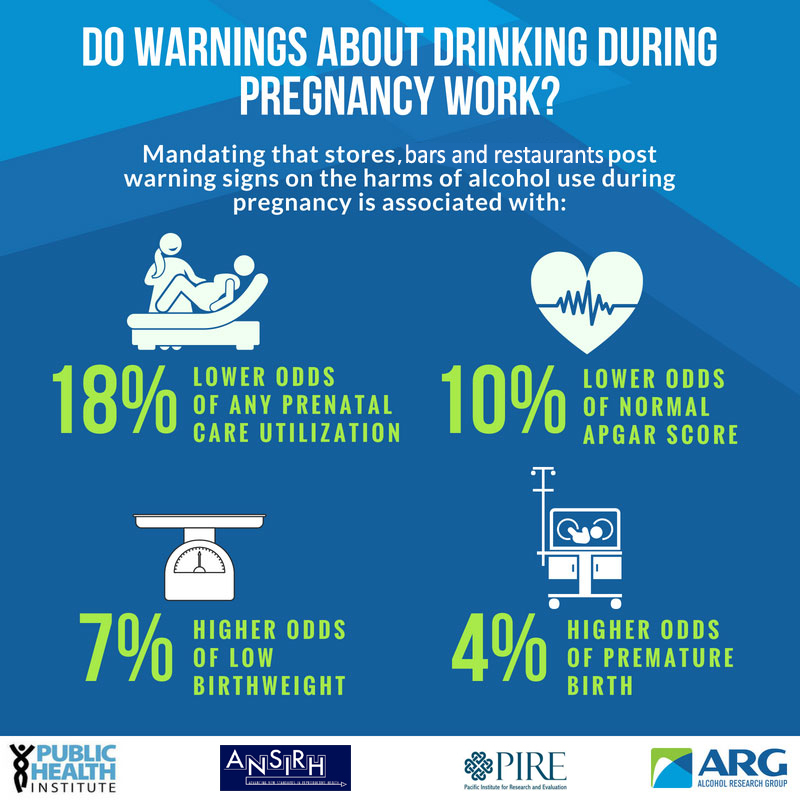 Download and share our issue brief, “The Impact of State-Level Alcohol and Pregnancy Policies on Birth Outcomes and Prenatal Care Use,” and the infographic created by ARG.